My Goodreads Reading Challenge for 2013 is to read (at least) 30 books. I looked around my couch and made a list of 26 “to read” books that were either on my Kindle, Nook, or coffee table. Some of these are Friday Finds because I recently got them in ebook form from the library. There are plenty of books I have stashed away that I can still get to but after making this list, I get the idea that I do not need to purchase any more books. Well, until I bump my challenge number to 40 or 50. I don’t think I’ll ever stop finding new books I want to read. Of course I also have classics to finish reading like Wuthering Heights and Jane Eyre. Again, these are books that I can access right now. There are plenty of others on my “to read” list. America’s poet, Walt Whitman, began working as a printer’s apprentice. Soon after surrounding himself with words through books at the library, plays and listening to famous speakers, he was writing and printing his own newspaper. His assistant was his eight-year-old brother, George. Walt went to Brooklyn and began writing poetry about “the common people” of the United States. Walt travelled more to the South where he wondered what he could do to help his country during the time of slavery and the brink of a Civil War. Walt read letters from his brother, George, who served in the Civil War. Walt continued to write and spent his time caring for wounded soldiers – one of them being his own brother. Walt often saw President Abraham Lincoln ride by. His intense admiration for Lincoln was apparent when he wrote “O Captain, My Captain” for the fallen President. Today Walt is still remembered as being a voice of the American people. Vardell writes that, “Enticing children to read biographies got a little bit easier with the arrival of picture book biographies. Here the presence of extensive illustrations adds visual interest along with details that enhance the authenticity of the time and place of the setting. In addition, the art helps personalize the subject” (245). 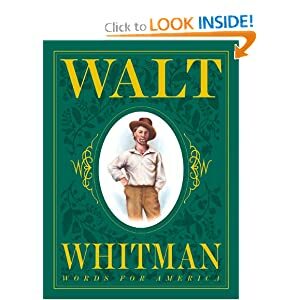 This picture biography of Walt Whitman is full of beautiful illustrations that capture the facts about the poet. While this is a book for children, the in depth poetic analysis would be too much for such an audience, so this book does a great job of sticking to important facts. The big illustrations of Walt with his brother and seeing Lincoln on his horse, for example, give a connection to the information. This being a book for grades 4 and up, I would use for middle school and even older students. Poetry is something hard to grasp for many students so having a simple biography with visual queues can help them comprehend what the poetry is about when we get to that heavier material. Actual Size is a book with large pages that show pictures of various animals and how they would look in real life on that page. The images are in a cut out and torn paper art form so there is a lot of detailed color for the atlas moth, the eye of a giant quid and the Goliath birdeater tarantula, for example. Each animal is not really shown in it’s full size on the page, but the idea is given to young readers as if they were up close to the large, small, cute and creepy animals. Information given on the animals such as “The Goliath frog lives in Africa. It’s big enough to catch and eat birds and rate” along with its measurements “length: 12 inches, 36 inches with legs extended…weight: 7 pounds.” Each animal is shown in full color with interesting facts about their size. “Concept books ‘explore the characteristics of a class of objects or of an abstract idea…typically size, color, shape, or spatial relationships…patterns in a class (for young children)…and cross-cultural concept books for older children’ (Hepler, 1998, p. 7)” (Vardell 239). This book is really interesting and something that is distinctly a children’s book but with informative captions. The colorful artwork makes a child’s eyes take in the whole page and see the animal that they are reading about. Importantly the information is limited and the picture is the primary teaching tool in this book. School Library Journal (June 01, 2004) reviews this book by saying, “The end matter offers full pictures of the creatures and more details about their habitats and habits. Mixing deceptive simplicity with absolute clarity, this beautiful book is an enticing way to introduce children to the glorious diversity of our natural world, or to illustrate to budding scientists the importance of comparison, measurement, observation, and record keeping. A thoroughly engaging read-aloud and a must-have for any collection.” I agree that this would work well for a story-time or read aloud for young children. 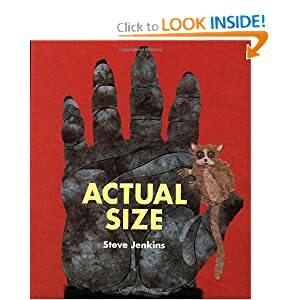 This book also won the Blue Ribbon Non-Fiction award and many of Jenkins other books such as Prehistoric Actual Size would work for young students to teach them basics about animals for a science class. Beginning with the Iceman of the Alps, this books covers the many bodies found in artic conditions. There are pictures and descriptions of how each body died and was recovered. Along with the Iceman, the book also includes people found in glaciers in Switzerland. Here there were soldiers and travelers who died and were preserved in the ice. There is also information about the frozen children of the Andes where the children were sacrificed to appease their gods. 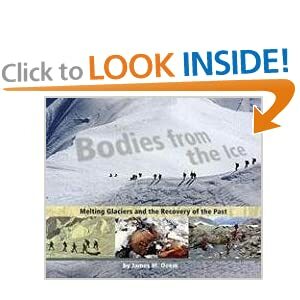 These bodies as well were preserved in the ice and the book provides photographs of these corpses. Everest hikers and tools are also shown being discovered in frozen climates that have been preserved over time. Vardell states that, “The photo essay book ‘particularizes and personalizes information making it more emotionally involving for the reader or documents and validates the truth of the text with photographs’ (Hepler, 1998, p. 8)” (239). I look at this book as if I were a middle school student who would be disturbed yet fascinated with the morbid science of this book. The pictures are absolutely necessary to show the reader what archeologists have found. The vivid details of the Iceman and the Andes sacrificed children really provides powerful understanding just by seeing these photographs. It is the photographs that draw the reader in to know all about who they, how they died, how they were discovered and how they managed to be preserved all this time. Booklist (Dec 01, 2008) reviews this book by saying, “Perhaps most fascinating to kids will be the chapter on recently discovered Incan children sacrificed to the gods. The pictures of these children, looking as though they might be sleeping, are arresting. Heavily illustrated with historical memorabilia as well as photos of bodies, scenery, artifacts, and rather simplistic maps, this offers a lot to look at and learn about.” I think this book would work well from the projected grades of 5-8 who were doing a section in environmental science. I would pair this with the other book by Deem called Bodies from the Bog. Having the photographs and spawned interest in the morbid would give students a springboard for class projects and presentations on subjects found in these books.